When Andy Starr walks away from the charred wreckage of Flight 432, he becomes an instant celebrity and sets off a chain of events that lead to a staggering finale. Two hundred people are lost in the crash and he is the only survivor. Is he just incredibly lucky or is he the Son of God? 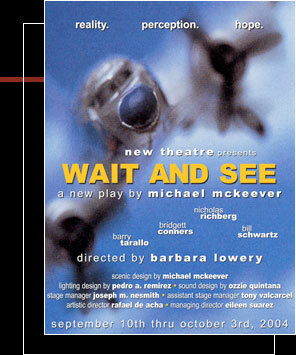 Reality, perception and hope all begin to blend together as Wait and See explores how miracles are created and religions are born. A fascinating study of man's never-ending need for answers. "McKeever is not afraid to pitch complex ideas like fastballs, challenging the audience to keep up with him." "McKeever flecks his narrative with gentle humor and compassion."